Do you have an over abundance of colored hard boiled eggs laying around? Can’t eat another egg salad sandwich?? Then I have the answer for you. 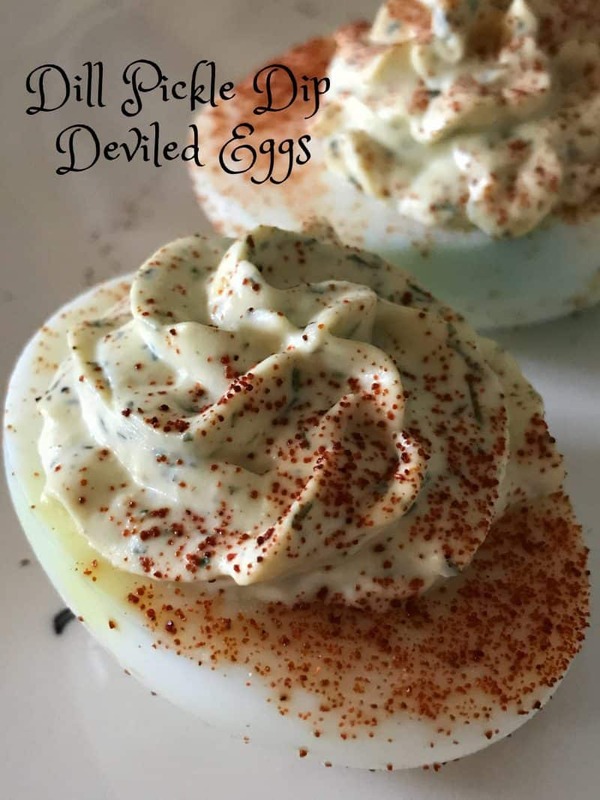 Why not make Dill Pickle Dip filled Deviled Eggs?? Say What?!? You read that right…left-over hard-boiled Easter eggs, peeled, sliced in half, yolks removed, mashed with a fork, combined with dill pickle dip and tossed back into the egg whites! 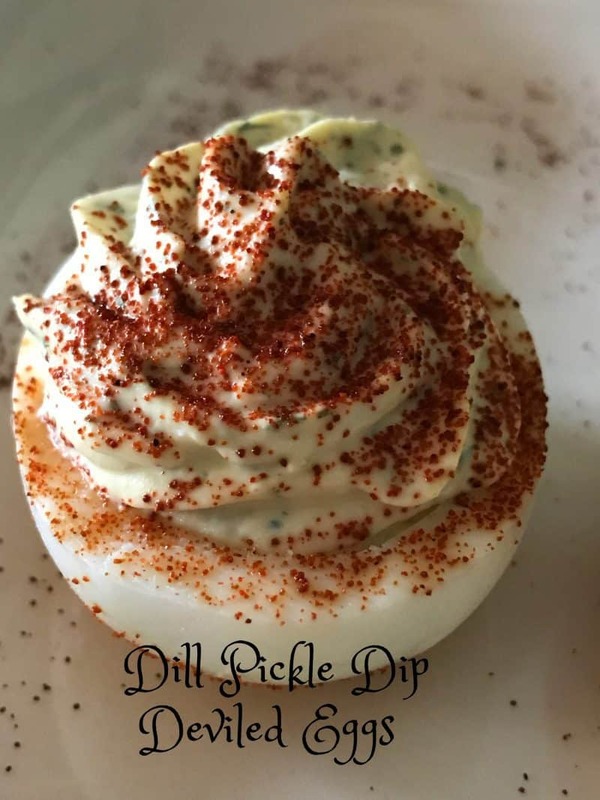 The recipe I’m sharing today is actually a follow up recipe or a back-to-back recipe or you could even call it a recipe revamped to the recipe I posted yesterday, Dill Pickle Dip. It’s simply egg whites filled with dill pickle dip. 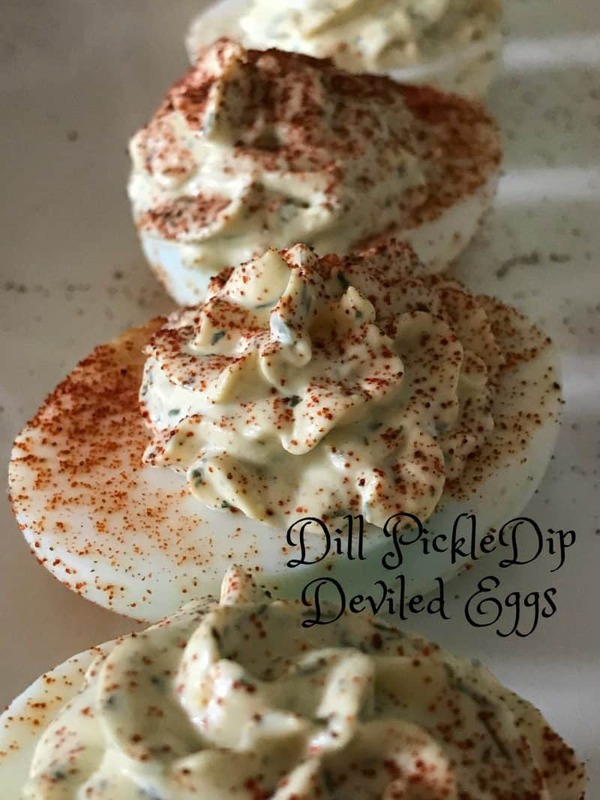 If you love dill pickles, dill pickle dip and deviled eggs, then I can say with good reason you’re going to adore Dill Pickle Dip Deviled Eggs. A fast, easy and ingenuous way to use up hard-boiled eggs. Stuffed Eggs or Deviled Eggs? Stuffed Eggs or Deviled Eggs? A hard-cooked egg that has been cut in half-lengthwise and the yolk removed, mashed and mixed with any of various flavorings such as minced fresh herbs, Worcestershire Sauce, mustard, curry powder, and so on. Other finely chopped ingredients including chives, toasted nuts, bell peppers, chutney and so forth, may be added. Enough mayonnaise or sour cream is blended into the mixture to make it a soft, moist filling. This mixture is spooned back into the egg-white halves and the top is usually sprinkled with paprika. 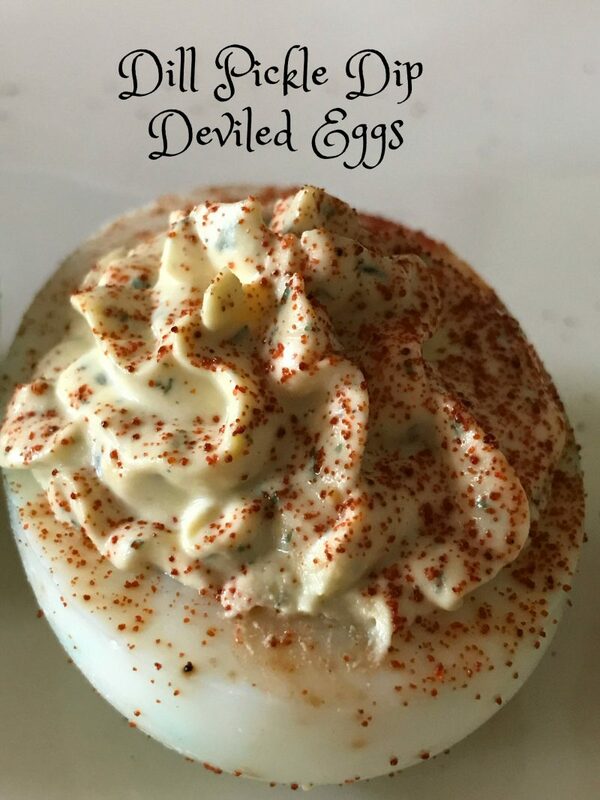 This is the Did You Know part…Adding cayenne pepper, or a hot sauce like Tabasco pepper sauce to the egg yolk mixture makes it a deviled egg. Hmm, I did not know that, did you? What’s your favorite pickle? My family loves Clauseen pickles. If you have an over abundance of dyed eggs left-over from Easter, here is a great recipe to make. Beware dill pickle fans....you'll love this recipe! Allow pickles to drain on a triple layer of paper towels for at least 15 minutes. Press on the paper towels to blot out as much excess moisture as possible. Set aside. Meanwhile, remove yolks carefully from egg whites and place yolks in a small bowl. Place egg whites upside down on a triple layer of paper towels to drain. Mash egg yolks with a fork, set aside. Using an electric mixer, cream together the cream cheese, onion, pickle juice, sour cream, real mayonnaise, dill, pepper, salt and garlic powder on medium-low speed until thoroughly combined. Add Diplicious Dill Pickle Dip Mix, if using. Using a rubber spatula, stir in the chopped dill pickles and mashed egg yolks. Using a small spoon or wide end tip and piping bag, fill egg whites. Refrigerate at least one hour and serve.